One North Texas assistant principal's gift of a pair of shoes to Ethan Buckley led to another act of kindness from Nike, and a special promise. CARROLLTON, Texas — Practically everyone at Hebron High School knows the name Ethan Buckley, but virtually no one has walked in his shoes. By all accounts, Buckley, who has cerebral palsy, is one of the nicest and funniest kids in the school. Last semester, Buckley and senior Marques Johnson worked together as office aides, running errands all over the school. Ethan Buckley had a big smile following a surprise from Nike. Because he has cerebral palsy, Buckley goes through about one pair of shoes each month. Since that can be expensive, sometimes his shoes get worn, and worn down way too much. It's something Assistant Principal Sandra Lee noticed last fall. “The gaping hole with his foot showing through, he needed some help," she said. So, Lee did some research and found Nike's FlyEase, a shoe line specifically inspired by athletes like Justin Gallegos, a runner with cerebral palsy. She surprised Buckley with a pair last fall. 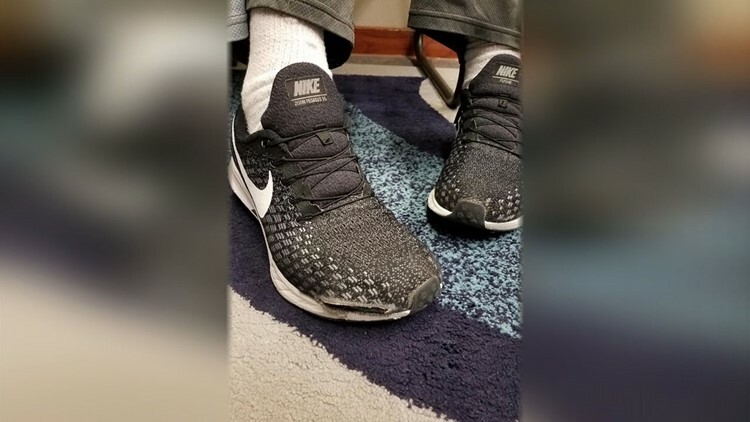 A pair of Nikes made specifically for people with cerebral palsy. Unfortunately, those didn’t hold up, either. So, the school called Nike to order more, but also to tell them that Buckley has never really had a good pair of shoes. That’s when a surprise arrived in the mail. Nike sent Buckley a free pair of shoes, which he obviously has enjoyed. But more importantly, the company wrote a note and made a promise to create a better shoe for people with cerebral palsy—all because they were inspired by Buckley. 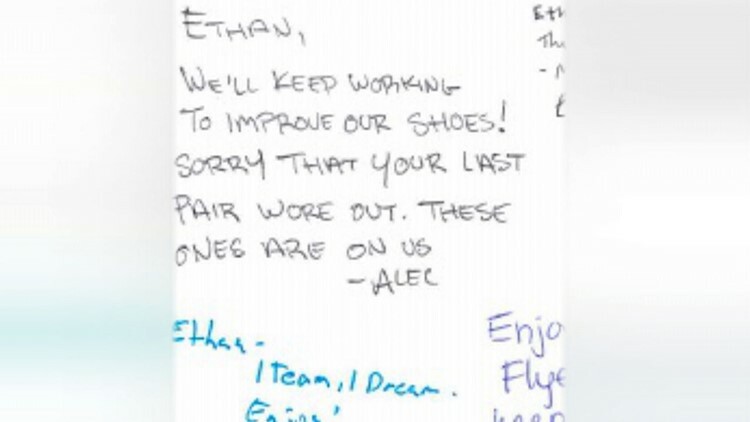 A note from the Nike team promised to work on improving shoes. Clearly, by getting Nike to listen, he's already up and running.